Hey all...I'm sure I'm over reacting, but Jack's minor collapsed trachea issues seem to be getting aggravated by all his sneezing the last week or so. To make sure he didn't have a cold I took him to the vet yesterday. She said he more than likely was just having allergy issues but offered to run blood work to just make sure. 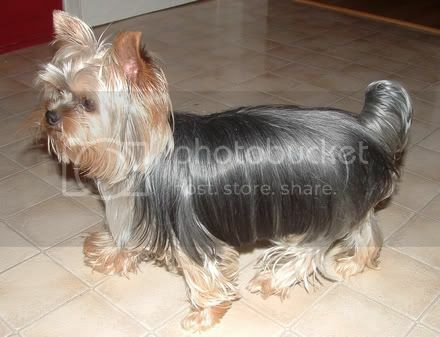 I let her and also had her do a base line chest x-ray since he is experiencing trachea issues at the age of almost 2. Everything looks to be normal (although at 7 pounds he really needs to take off 2…this is our TOP priority). I'm really worried about his collapsed trachea issues. It seems like he's either doing it all the time for weeks or not dong it at all for months. 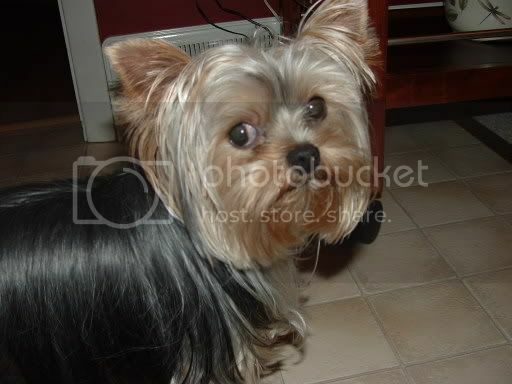 Would you mind sharing your stories about your yorkies collapsed trachea? I've had no personal experience with this problem, except that I had to be very careful of Muffin's neck area even in her harness and not pull too hard. I feel for you, because I know how you worry. You might ask your vet if giving children's liquid benedryl would help or not. Just a thought. If it stopped the sneezing, then the other problem wouldn't be exascerbated. Last edited by yorkieusa; 07-15-2006 at 07:38 PM. I do worry....I know collapsed trachea can be minor and dogs can live a very long time with it, but I'm so freaked out. The vet was so kind and called me this morning to give me the all clear on his blood work. She staied on the phone with me for 20 minutes! I'm just curious how Jack compares to other dogs and wonder if I should be taking steps now (other than the weight loss) to prevent things from getting worse. I did a YT site search on "collapsed trachea" and have been in tears all night over some of the things I've found. I just want what's best for Jack as he has been such a wonderful and loving support over the last very difficult year of my life. The vet did give me info on benedryl and I'll be running out to get some tomorrow. Thanks for your supportive post! It really does help! I do not have any experience with collapsed trachea,I just wanted to say that it sounds like you are doing everything in your power to protect Jack and you are to be commended. 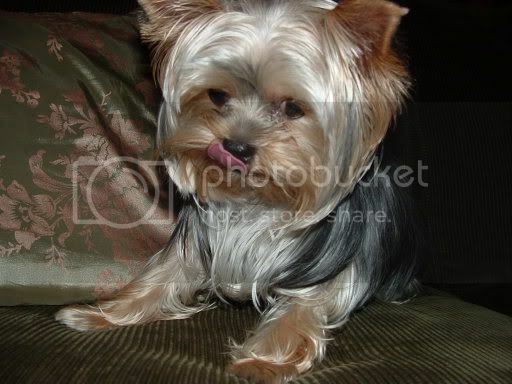 I have had 3 yorkies prior to Cali and all 3 had some degree of collapsed tracheas. Zorro and Karma both lived to be 13 years old with only some coughing on excitement. Gracie had a very severe CT and it was collapsed in the thoracic area which is a bad place for it to collapse. Also she would play on a tie out and chase her soccer ball and I think the tugging on her neck from that made it worse or even caused it. Since then I never but a collar on my dogs or let then tug on a leash. I believe this shortened her life by several years, but hers was a very severe case. They can live normal lives with this. I would definately keep His weight down no collars or pulling on his neck. My vet also perscribed bronchodialators for Gracie. It sound like with Jack having a mild CT he should do fine if you follow your vets advice. Good luck I will keep good thoughts for Jack and you. I don't have any experienced with the collapsed trachea, but if the vet thinks Jack is having allergies, you might want to evaluate his food for any possible culprits (corn, wheat, diary). If they are food allergies and you can change his diet, perhaps the sneezing would go away on it's own and that would help. Oh poor baby - I would feel the same as you do ...I can't offer help on the collapsed trachea ...but can offer a little help on the snorting or sneezing sounds - BOTH my girls do that when excited or they drink water too fast. I can very well understand what you are feeling and my heart goes out to you both. Below is a link from a post I wrote not too long ago were I talk about something like this. I was told once that this is what my Buffy had, then allergies...... I bought an air purifier, new Kerby vacuum (not cheep)....on and on. Oh something I forgot to say in that post....my vet gave some drops that you put in her nose for when she sounds stuffy, it opens up her sinuses fast and good. She would have these attacks during the night really bad. Also I have notice she has more problems during the summer when the air is dry and especially when air is really bad from fire's. The weight problem plays a Big part, Buffy can only eat R/D food from the vets office. It is 40% less fat, what you find in pet stores is only 8% (give or take) less fat. Read my story and if it sounds like what your going thru I have more info. feel free to PM me. Sorry I'm really sleep now. I have no advice. I just wanted to wish you well and hope the problem never gets serious. So I tried the benedryl yesterday...it seemed to help a little. He slept more than anything. I did more research on collapsed trachea. I'm a little confused as some web sites say there is a difference between collapsed trachea and reverse sneezing. Does anyone know if this is true? Based on the descriptions I read it sounds like Jack has more of a reverse sneezing issue. He doesn't cough he honks. So I tried the benadryl yesterday...it seemed to help a little. He slept more than anything. I did more research on collapsed trachea. I'm a little confused as some web sites say there is a difference between collapsed trachea and reverse sneezing. Does anyone know if this is true? Based on the descriptions I read it sounds like Jack has more of a reverse sneezing issue. He doesn't cough he honks. you gave him Benadryl? regular for adults? and how much did you give him? this is not something you can always give them, with time it will raise the pressure in their eyes. I was giving Buffy the Children's Benadryl, no alcohol, no sugar and the doctor told me only 3 little line on a small syringe (almost nothing) and only at night when she sounded congested so she can breath better and sleep well. This was before they gave her the right meds. Now I only use it on my Maltese around the 4th of July, it takes the edge off when they are nervous.